Raymond Dewey "R.D." 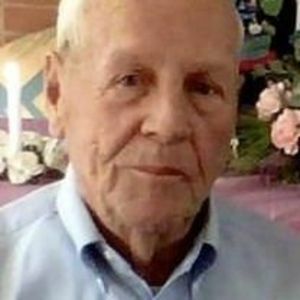 Ferguson, 86, of Liberty passed away at home on Friday, December 29, 2017. R.D. was a native of Randolph County and grew up in Staley. He served his country in the US Army and was a Korean War Veteran. A funeral service will be held on Tuesday, January 2, 2018 at 2:00 p.m. at The Loflin Funeral Home Chapel with Rev. Danny Thomas and Jimmy Gray officiating; burial will follow in Staley Cemetery with military honors provided by The Randolph County Honor Guard. The family will receive friends one hour prior to the service at the funeral home. He was the son of the late Dewey Raymond and Sally Bray Ferguson and was also preceded in death by his daughter, Pat Brewer; sisters, Carolyn Shaw and Polly Thomas; and brother, Sam Ferguson. Surviving is his wife of 52 years, Susie Overman Ferguson; sons, Dewey, Kenneth (Debbie) and Eddie Ferguson; daughters, Lisa York (Ronny), Angelia Ferguson and Jessica Ferguson; five grandchildren and nine great-grandchildren; sisters, Diane Grimes and Gladys Haithcox and brothers, Bob, Mike and David Ferguson and several nieces and nephews. In lieu of flowers, memorial contributions may be made to Victory Mountain Camp, PO Box 4085, Archdale, NC 27263.